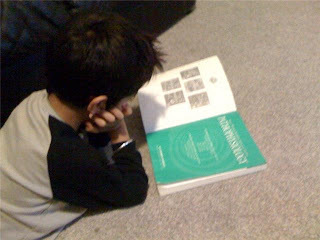 i walk in the house the other day and Jai is on the floor examining a book on pathophysiology. i couldn't pull him away from it; later on over apple juice he told me that he could feel the juice in his small intestine, awesome. youngblood asked me the other day "what is this blo toe fo toe thing, dad?" i showed him your website, and now he's running a blotto photto sticker on his deck too, holla! Youngest member on the blottophotto sticker team !